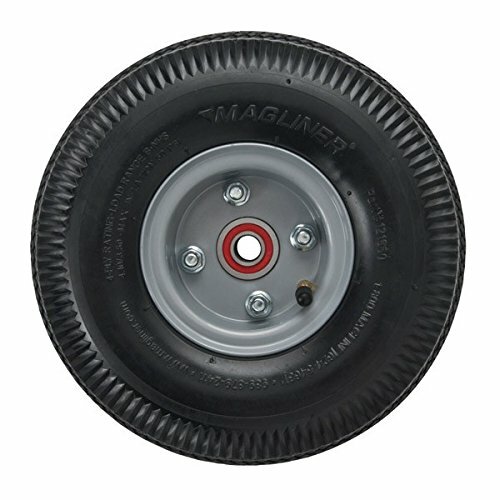 The Magline 121060 pneumatic wheel is 3-1/2" wide with a 10" diameter and a 5/8-inch axle hole diameter, and it has a 250-lb. load capacity. The wheel has an inner tube to help resist punctures when inflated to the required pressure of 40 to 50 psi (pounds per square inch), a three-piece bolted hub for strength and to facilitate replacement of the inner tube, and two red sealed semi-precision ball bearings to help reduce friction and support the load, and it is suitable for use on many surfaces and terrains including rough surfaces such as gravel and uneven terrain. This wheel is typically used as a replacement part for most Magliner two-wheel hand trucks. The hub is off-set to provide greater clearance between the wheel and the hand truck compared to center-mount hubs. The inner tube comes with a valve stem cap to help maintain the tire pressure. No assembly is required. Magline manufactures Magliner brand hand trucks, dollies, ramps, and other products for material handling applications. The company, founded in 1947, is headquartered in Standish, MI. Pneumatic (Air) Tires 10" with tube for easy repairs. If you have any questions about this product by Magliner, contact us by completing and submitting the form below. If you are looking for a specif part number, please include it with your message.